In recent years, with the continuous development of consumer electronic products such as smart phones, LED lighting, panel computers, and wearable devices, transparent brittle materials such as glass and sapphire have been widely used due to their excellent physical and chemical properties. For example, hard tempered glass is used as a display screen for smart phones. Hard and scratch-resistant sapphire can be applied to 3C products such as LED substrate, protection mirrors of mobile phone camera, and cover glass of smart watches, etc. Moreover, it is the preferred material of motion sensor, which is the important component of the autonomous driving technology, equipment for road monitoring and warning and display equipment of large window. It can protect the normal operation of equipment even in the harsh operating environment. At the same time, its material properties have been favored by military drones, deep sea dive equipment and aerospace technology. And with the development of wireless charging and 5G communication technology, the backplane of smartphone also uses glass to improve the quality of signal transmission. The glass and sapphire used in these applications are usually with thin thickness, high hardness and brittleness. But it is necessary to cutting, drilling and grooving on these materials with higher machining accuracy. And the processing tends of this kind of materials are to be smaller in size, lighter in weight and lower in cost. Therefore, the traditional chemical etching and mechanical processing technology is facing great challenges. Laser, as an advanced processing tool, has played an increasingly important role in industrial production. With the continuous development and improvement of laser technology, it has shown its unique advantages in the processing of transparent brittle materials such as glass and sapphire by virtue of its characteristics of processing accuracy, processing quality, processing complexity, processing efficiency and environmental protection. The research team Professor Xiaozhu Xie has been researched on basic theory and method of laser fine machining, modeling and simulation of machining process and detection technology for transparent brittle materials. In laser dry machining, the team proposed a novel laser patterning technology of high-contrast, durable and damage-free based on a low-cost infrared nanosecond laser on a glass substrate. In laser induced backside wet etching, the team developed a working solution for efficient cutting of sapphire. They established a three-dimensional model of the interaction between laser and multi-dielectric layers and simulated the material removal process of LIBWE considering the effects of enthalpy change and latent heat. 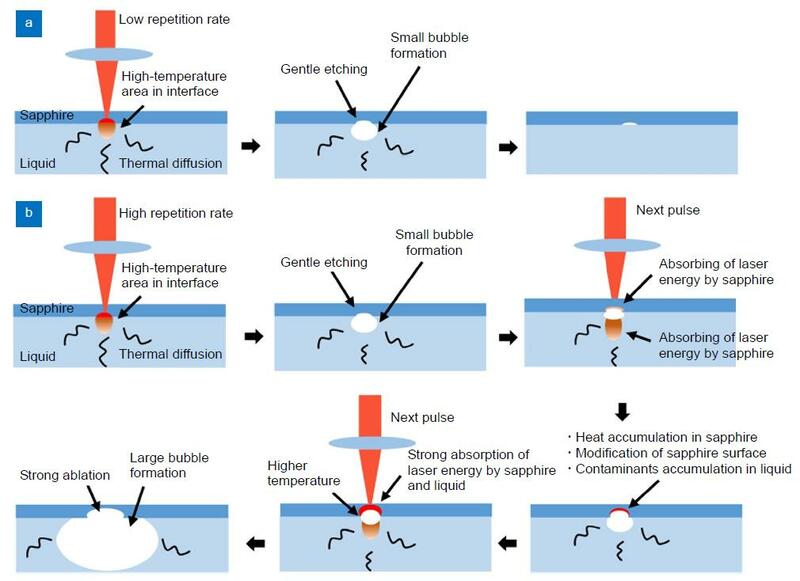 The mechanism of LIBWE and the assistant enhancement mechanism of micro-nano suspended particles are revealed by studying the dynamic behavior of cavitation, micro-jet and pressure variation during machining. High quality machining of transparent brittle materials such as glass and sapphire has been realized. In this review, Professor Xie Xiaozhu’s research team summarizes a series of laser machining methods, e.g. laser full cutting, laser scribing, laser stealth dicing, laser filament, laser induced backside dry etching (LIBDE), and laser induced backside wet etching (LIBWE). Additionally, applications of these techniques in micromachining, drilling and cutting, and patterning are introduced in detail. Current challenges and future prospects in this field are also discussed. The research team of Professor Xiaozhu Xie belongs to the Research Center of Laser Micro/nano fabrication, College of Mechanical and Electrical Engineering, Guangdong University of Technology, and the State Key Laboratory of Precision Electronics Manufacturing Technology and Equipment. The team has 5 key teachers and more than 20 master/doctoral students. In the long-term scientific research practice, the team is dadicated to the research of laser fine processing technology for transparent brittle materials and ultra-fast laser surface micro/nano fabrication technology. They have completed a number of projects of National Natural Science Foundation, National Key R&D Program, Guangdong Natural Science Foundation and Guangzhou Science and Technology Program. More than 40 papers have been published and co-published in SCI journals such as ADV MATER INTERFACES, INT J HEAT MASS TRAN, and more than 20 patents have been granted. The team developed a new technology of infrared laser backside wet cutting of sapphire substrates, which systematically revealed the mechanism of LIBWE based on metal salt solution system, and solved the problem of processing of sapphire with low cost and high quality. The ultra-fast laser CMP compound polishing technology is proposed to solve the problem of high-efficiency and high-quality polishing of the third-generation semiconductor basic material SiC. A new type of thermally conductive flat micro heat pipe with high thermal conductivity (minimum thermal resistance of 0.002 ° C/W) was developed by using short pulse laser to realize the preparation of gradient surface wetting structure and the gradient control of wetting property. Multi-scale micro/nano composite cauliflower structure is induced on the metal surface by high-frequency nanosecond laser. The adhesion force between superhydrophobic surface and water was only 1.4 μN, which was the lowest reported in the paper. The morphology of micro/nano structures induced by metal surface can be controlled by controlling laser pulse width. Through the optimization of the surface microstructure, the frost resistance is up to 20 times higher than that of the ordinary metal surface. Xie X Z, Zhou C X, Wei X, Hu W, Ren Q L. Laser machining of transparent brittle materials: from machining strategies to applications. Opto-Electronic Advances 2, 180017 (2019).